It's been my contention since the overthrow of Hosni Mubarak in February that (1) this was a military coup d'état against the prospect of Mubarak's son taking power and (2) the military brass intend to hold on to power. On the latter point, I wrote in April: "The soldiers have become far too accustomed to power and the good life to give up these perks. They will do whatever it takes, be it purging Mubarak, throwing his sons in jail, banning his old political party, changing the constitution, or repressing dissent, to keep power." The military announced Tuesday that it planned to adopt a "declaration of basic principles" to govern the drafting of a constitution. … it will spell out the armed forces' role in the civilian government, potentially shielding the defense budget from public or parliamentary scrutiny and protecting the military's vast economic interests. Proposals under consideration would give the military a broad mandate to intercede in Egyptian politics to protect national unity or the secular character of the state. … Though the proposed declaration might protect liberals from an Islamist-dominated constitution, it could also limit democracy by shielding the military from full civilian control. Demonstrators have returned to Tahrir Square with increasing frequency to voice their demands, culminating in a weeklong sit-in rivaling the days of the revolution. … The protests are increasingly taking aim at the military. On Thursday, a coalition of 24 political groups and five presidential contenders endorsed a call by the young leaders of the protests for the military to cede more power to a civilian government now rather than wait for elections. The military leaders are sounding increasingly exasperated. Chants against [Field Marshal Hussein] Tantawi and military rule are now common in street protests in Egypt. This appears to have angered the generals, who believe they played a key role in helping topple Mubarak's regime by choosing to remain neutral during the uprising. Tantawi also appeared to have been annoyed by the stir created by a walkabout he took last week in downtown Cairo wearing a business suit and tie. His appearance out of uniform had sparked speculation in Egyptian media that he might be contemplating a run for president. Egyptians, he counseled, should make better use of their time by focusing on work rather than listening to people talking about his attire. "Did they want me to wear a torn suit?" he said, alluding to comments posted on the Internet's social networks that the career soldier looked smart in a business suit. Growing in confidence after eight months in power, Egypt's military generals appear more determined than ever to crush the protest movement that ousted Hosni Mubarak and has turned critical of their rule. … At the same time, the military leadership has been drumming up an image of itself as the nation's foremost patriots, even as it steps up moves to silence critics, leaning on managers of media outlets to tone down commentary on the army or ban particularly vocal critics from appearing on political talk shows. The military has shrugged off criticism of its handling of the post-Mubarak transition, including complaints that it has kept in place much of the former ruling party and regime loyalists in powerful political and security posts, has resorted to Mubarak-era abuses like torture and has acted unilaterally in setting the course for the country. 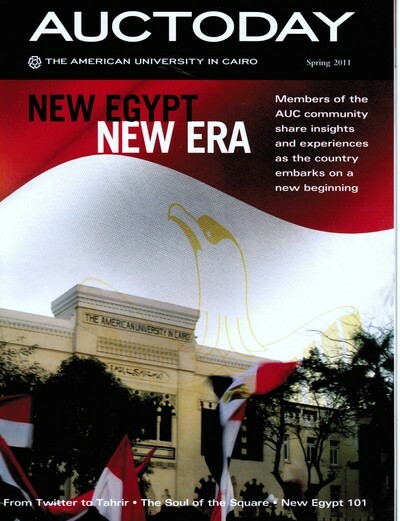 Just as Mubarak often did, Tantawi has used scare-mongering and patriotism to justify the military's heavyhandedness. "We are patient, patient, patient for the sake of Egypt," he recently told reporters. "Look around us, do you want us to be like that?" he said, alluding to Libya's civil war. In what many saw as a trial balloon, posters went up briefly last week in Cairo and the Mediterranean city of Alexandria voicing support for the head of the military, Field Marshal Hussein Tantawi, as a presidential candidate. … Tantawi, who during Mubarak's rule hardly ever appeared in public and was never seen out of his uniform, recently took a highly publicized stroll in the streets of Cairo in civilian attire, shaking hands, patting shoulders and chatting with passers-by. The walkabout further raised speculation of a presidential run. In another move seemingly intended to whip up patriotic sentiments, state television carried live a ceremony to hoist the Egyptian flag on a newly built 575-foot (176-meter) iron tower in central Cairo. 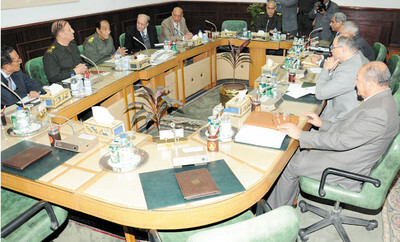 The Monday ceremony, presided over by a member of the ruling military council, coincided with Tantawi's 76th birthday. Activists and politicians are worried that the military, the country's most revered institution before the revolution that overthrew President Hosni Mubarak in February, refuses to have its authority and financial interests answerable to an emerging democracy. Concerns were heightened this week when the military-backed interim government announced parameters for writing Egypt's new constitution. The proposals allow the generals to appoint 80% of the constitutional committee. They also state that the defense budget would be kept secret and the military would be the "guardian" of the constitution, raising the possibility of intervention in legislative and presidential affairs. Tantawi appeared last month "in a video clip that showed him walking in downtown Cairo in a civilian suit, not his usual military uniform. At that point mutterings were heard about a potential presidential bid. Indeed, after criticism it has never before had to deal with, the military is keen to display a more media-friendly image."